Merritt Chase is growing! Read more about our teammates Nich Steinkraus and Alexandra Mei on our About page here. Nich joined Merritt Chase this past Fall as a landscape and planting designer. With almost a decade of professional landscape architecture experience working with firms including OLIN, Sasaki, and David Rubin Land Collective, his work encompasses a wide range of typologies including residential, campus, urban, governmental, and design competitions. His planting designs incorporate form, color, and texture of native and adapted plant species. Nich studied landscape architecture and horticulture at Purdue University, during which he was awarded a Student Honor Award by the American Society of Landscape Architects' Indiana Chapter and the Donald J. Molnar Scholarship Award. Alexandra joins the team after two months of traveling in Japan as the Harvard GSD Charles Eliot Traveling Fellowship recipient. As a landscape designer with Merritt Chase, Alexandra works to infuse a subtle, yet powerful presence of art into our surroundings. Prior to joining Merritt Chase, Alexandra worked at Munden Fry Landscape Associates, Surfacedesign, and Gensler. She graduated from the Harvard Graduate School of Design with a Masters in Landscape Architecture and received her Bachelor of Design in Architecture from Washington University in St. Louis. She has received multiple honors including the GSD Thesis Award in Landscape Architecture, the Landscape Architecture Foundation’s University Olmsted Scholar nomination, and the 2017 GSD Charles Eliot Traveling Fellowship. 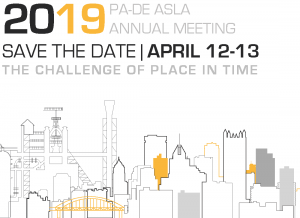 Nina joins Anna Cawrse of Sasaki and Dave Kushner of Remnant Brewing to present “Beer Urbanism: How Beer is Transforming our Urban Landscapes” at this year’s Pennsylvania - Delaware ASLA Annual Meeting on April 13th. The panel will introduce the cultural drivers for beer-focused urban developments, including urban breweries, pop-up beer gardens and destination food halls. Precedent projects will be presented including Merritt Chase’s Bow Market and the Lawn on D. The panel will explore, from concept through construction, how to design for beer, including legal constraints and spatial programmatic needs. Season 2 of Daylight starts now! Last week, People for Urban Progress (PUP) and Exhibit Columbus kicked off the second season of Daylight, a four-part speaker series highlighting the work of national and Indianapolis-based thinkers and doers. This month’s event featured Jha D Williams of MASS Design Group and Danicia Malone of Purdue’s Black Cultural Center. This season brings “rock star national and local voices together to curate authentic conversations surrounding inclusion, equity, dignity and justice to define thoughtful and responsible design for our city. “ Read more about the series on PUP’s blog here. Keep your eyes out for the next event April 24th, 2019. Daylight is graciously supported by Ambrose Property Group and Central Indiana Community Foundation. 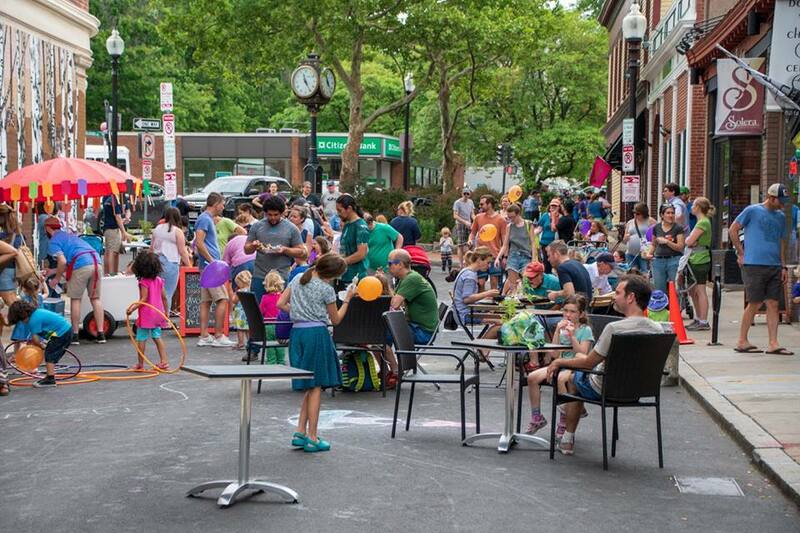 Merritt Chase Selected to Pedestrianize Birch Street in Boston's Roslindale Village. Merritt Chase has been selected by A Better City, the City of Boston and Roslindale Village Main Street to design for the temporary pedestrianization of Birch Street in Roslindale Village. The plaza renovation process will include the closure of Birch Street and the design of a tactical plaza in alignment with the city’s newly released Tactical Public Realm Guidelines. This month, construction began on the renovation of Hazel Ruby McQuain Riverfront Park in Morgantown, WV, home to West Virginia University. Led by the City of Morgantown, the park renovation includes improvements to the existing trail and amphitheater, a new gathering plaza, and the new Walnut Street Landing landscape. Design and construction is funded by a generous grant from the Hazel Ruby McQuain Foundation. Merritt Chase is leading the site design alongside team members Strada, Thrasher, and March Westin. Follow along for construction updates on the City of Morgantown’s dedicated website here. It takes a village! Bow Market, a collection of 30+ incredibly dedicated restaurateurs, makers, drink purveyors, comedians, and craft beer nerds, was just named the #3 best new restaurant in Boston by the Boston Globe. Read about Boston’s 37 best new restaurants here. Merritt Chase, along with team members Ethos Collaborative and JASE Construction Services, have kicked off a series of Community Greening Assessments with the Western PA Conservancy (WPC). Working with WPC and community members in Clairton, PA and Harrison Township, we are working through a three phase process of hydrologic inventory and green infrastructure opportunity mapping, design, and construction of green infrastructure facilities. Keep your eyes peeled for construction in Spring 2019! This Monday, we’ll be sharing the small steps we’ve taken to build our young practice. Join Nina Chase at 4pm EST for the Landscape Architecture Foundation’s latest Emerging Professional’s webinar featuring Los Angeles-based landscape architecture firm Superjacent and Merritt Chase. Fun #landarch fact, both firms were founded by past LAF Olmsted Scholars, Chris Torres ‘12, Chris Merritt ‘11, and Nina Chase ‘09. Update: A recording of the live webinar lives here. Join Merritt Chase’s Chris Merritt in conversation with Frida Escobedo and Daniel Ostroff on Thursday, November 15th at 5pm for an Exhibit Columbus Evening Conversation in Columbus, Indiana. Meet 2018-19 J. Irwin and Xenia S. Miller Prize Winner, Frida Escobedo of Frida Escobedo Studio in her first public presentation in Columbus. Escobedo’s studio will create an installation for the Cleo Rogers Memorial Library Plaza during Exhibit Columbus’ 2019 exhibition, which opens to the public on August 24, 2019. Special guest Daniel Ostroff, an Eames scholar and film producer, will present on Eames + Morality prior to our program with Frida Escobedo. Ostroff is the author of "Modern Classic", "Eames + Valastro", and "Collecting Eames." He was consulting curator for Eames Words and curator of Collecting Eames: The JF Chen Collection, both for The Getty Museum’s Pacific Standard Time Consortium. Following presentations by Daniel Ostroff and Frida Escobedo, Chris Merritt will lead a moderated discussion with our guests. Merritt is a landscape architect and founding principal of Merritt Chase, and currently serves on the Curatorial Advisory Committee for Exhibit Columbus. Next Tuesday evening join Merritt Chase and People for Urban Progress (PUP) at DAYLIGHT for the debut of the Central State Vision Plan and the celebration of PUP’s 10-year anniversary. The Central State Vision Plan is a plan for campus connectivity and the Historic Grove. Learn more about the plan here. RSVP for DAYLIGHT here.